This B&H Kit of Canon's XA11 Compact Full HD Camcorder Kit with Epiphan Webcaster X2 is assembled to provide you with an HD camcorder and webcaster for live streaming to YouTube Live or Facebook Live. The camera's HDMI output is a perfect match for the HDMI input on the Webcaster X2, which allows you to stream via a Wi-Fi network or over your LAN. The XA11 features a 20x optical zoom for getting close to your subjects, and supports 1080p at 59.94 fps. It provides manual or automatic focus for sharp, clear images and even supports capture at 23.98 to bring a cinematic look to your videos. Two built-in SD/SDHC/SDXC memory card slots allow you to record video to available media cards in both slots at the same time. This allows you to create an instant backup copy for archiving and data protection. You can also capture high-resolution AVCHD or MP4 video files on one card while creating a lower data rate MP4 more suitable for the web on the other card. When using two media cards and the camera is in Relay mode, there is no need to stop shooting to swap out a full media card; when one card becomes full, recording seamlessly switches to the other card. The XA11 features peaking and 2x image magnification as focus aids. The camera can display and record color bars or color bars with reference tone. The color bars comply with the SMPTE standards. Reference tone levels can be set at -12, -18, or -20 dB. The XA11 features selectable manual/automatic control on the camera functions, allowing you to choose the best settings for the situation. Functions include: Exposure, Shutter Speed, Iris, Gain, Exposure Lock, AGC Limit. White Balance features six presets (Daylight, Shade, Cloudy, Tungsten, Fluorescent H, and Fluorescent), as well as two manual white balance settings. Additionally, when specific adjustment of the color temperature is desired, the color temperature may be adjusted in 100K increments from 2000 to 15,000K. Dual recording: Allows you to simultaneously record the same footage to different media cards using different codecs and bit rates. Double-slot recording: Allows you to record simultaneously to each of the two SD memory card slots, providing an instant backup for your footage. Relay recording: The XA11 automatically switches video recording from one memory card to the other when the first memory card becomes full. USB: An integrated Hi-Speed USB (mini-B) port allows you to download footage from the memory cards. This port is for output only. Remote control port: The camera features a built-in 2.5mm stereo mini-jack for LANC control. Photo capture: The XA11 offers the ability to capture 1920 x 1080 still images. Photos may be captured to an SD memory card during recording, as well as "frame-grabbed" during playback. Pre-record: The XA11 continuously buffers approximately three seconds of video in memory. When you begin recording, the contents of the buffer memory are added allowing you to capture footage before you press record. Intelligent battery system: The XA11 is compatible with Canon's Intelligent lithium-ion batteries, which communicate remaining running time (down to the minute) to the user. Language support: The XA11 supports 27 languages: Czech, Danish, German, Greek, English, Spanish, French, Italian, Hungarian, Malay, Dutch, Norwegian, Polish, Portuguese, Romanian, Finnish, Swedish, Turkish, Russian, Ukrainian, Arabic, Farsi, Thai, Chinese (simplified characters), Chinese (traditional characters), Korean, and Japanese. XA11 Compact Full HD Camcorder with HDMI and Composite Output is rated 4.1 out of 5 by 14. Rated 5 out of 5 by gustavo from Camcorders are still alive Purchased this camera when it came out and couldn't be any happier with my purchase.? This camera has so many options that not too long was only available in high end cameras. Great image, easy to use, loaded with features.? The one thing i have to complain about it is the microphone holder, when i have the dead cat on my Rode NTG3, it shows in picture, the holder is too low I had get a shock mount and mount it to the hot shoe, other than that i love this camera. Rated 5 out of 5 by Weeze G from Great Great HD Camera. This cameras are awesome ,i own two of this and also a G21 which has the same sensor and i do events with 3 camera setup,im very pleased with the results,the controls the image quality and reliability are top notch,1080p still have life and this is a very mature camera,i love the Xa series.Buy it you wont be disappointed . Rated 5 out of 5 by Jeffrey from Turned out to be a good camera This was not my first choice. I wanted the XA30. But went I went online to buy it, it had been discontinued. So I got the XA11 instead. I'm happy with it. Great image quality. Easy to get to know and use. One quirk: the microphone holder is flimsy. It needs a screw to better secure it to the handle (see photo). It has a screw on top to secure the actual microphone holder when closed, but it really needs another one (see directly above shoe). Rated 5 out of 5 by Jose from best video cameras Been using xa series cameras for a long time, they are reliable and full of features, i have 3 of these cameras and do multi cam event shooting, they perform excellent, they other reviewer is complaining about Xa30, don't make reviews if you don't have the camera or you have a lemon, this cameras are very popular and that can't be a mistake, buy it 4K is not nesesary for now. Rated 1 out of 5 by Nelson from Zoom is defective The XA11 apparently replaced the XA30. My XA30, a little over a year old, is worthless! It will just start ZOOMING all by itself. Over 25 years in the business, I use many different cameras/manufacturers and do not use "this" one all that often which is what makes it even more shocking. It has been meticulously cared for. Started searching and found that I am not alone and this is a common problem. I'm sure Canon just changed the model # to cover up this issue. I won't look to Canon again. Lucky you.....You've been warned. Rated 4 out of 5 by Jeffrey2019 from Excellent value I am very happy with the image quality. The camera is relatively easy to learn how to navigate. The XLR inputs are convenient. The mic holder is a little flimsy. I've used this camera on two projects so far and gotten great results. Rated 5 out of 5 by Jamie from Nice camera, great color. Quality camera with great futures. Mini HDMI output provides excellent colors. 20X optical zoom is pretty good too. Rated 5 out of 5 by Charles from Check it out I usually buy Sony but wound up using XA30's for another project and those were excellent. Then needed a camera with SDI and Canon came through at a great price point. Codec to the card is very clean and this camera really handles the low-lite. What is the color space on the hdmi output? 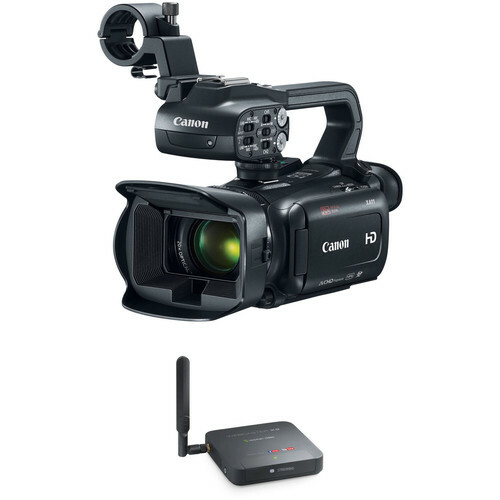 And does the xa15 allow both the hdmi and sdi to output at the same time? If so, is the color space the same for both? This camera is HD therefore the color space is REC 709. On the XA15 you can output through both the HDMI and the SDI the exact same signal. Again, that means the same HD REC 709 color space. Does the canon xa11 record in 60p ? And is the image quality the same as the Canon XA30? Yes it can, the XA11 records 1920 x 1080 at up to 59.94p. It also has the same sized 1/2.84 CMOS Sensor as the XA30. It should have the same quality of image. The difference is the XA30 adds WiFi, Wide Gamma DR Mode and has a slightly larger 3.5 screen compared to just 3 on the XA11. does the XA11 record date time? ( h:m:s) . Necessary for legal work. does this have a zoom input? If you mean a zoom lens then yes it has a great zoom, a true 20X that is great. The stabilization is great also. is not possible make photos with that canon xa11 ??? This camcorder can take photos. When set in AUTO mode, for example, there is a green dot on the touch screen you press to take a photo. can you manually focus lens? Yes, you will be able to manually focus the lens. Does this camera take a 43mm converter? Nope, the lens has 58mm filter threads. Is the HDMI a Clean Out? Can I use this camera for Live Streaming? Yes. We use two of them for live streaming on a regular basis. We plug them into our Blackmagic switcher via HDMI in the studio and convert them with an SDI converter for longer runs at events.